CAULFIELD hosts a bumper 10-race card this Saturday which features the $3 million Group 1 Caulfield Cup and the $500,000 Ladbrokes Classic. 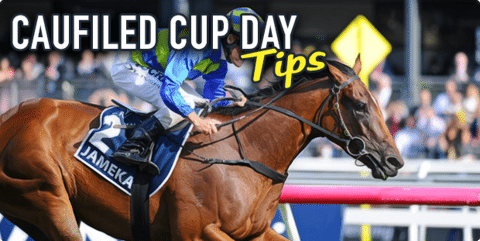 The Caulfield Cup attracted a full field of 20 runners which includes four international runners from some of the biggest stables in the world. The local hopes will be hoping to keep the Caulfield Cup on home soil and Jameka has been the top elect for many punters so far. It’s one of the best punting days of the season and the big betting fields means there will be great value in every race so sign up to Sportsbet where punters get $50 back in bonus bets if your horse finishes second or third in any of the first four races at Caulfield. Sylpheed has been well backed after opening at $2.25. The Waterhouse/Bott-trained filly is now into $2 following its 2.25-length win at Caulfield. The three-year-old has a tricky barrier of 11 which is a concern, but it looks to have ability and Damien Oliver will be looking to get his day off to the right start. James Cummings lines up Skylight Glow which is looking to continue to good run for Sydney form in Melbourne. The three-year-old finished seventh lengths behind Global Glamour in the Flight Stakes, but its form prior included placings behind Swear and Foxplay. Chance here at $4.20 if it gets some early luck from the wide draw. Swampland has plenty of potential after winning at Mornington last start. This is a big step up from maiden grade, but trainer Henry Dwyer has a big opinion of it and it could show some cheek at odds of $16 and $4.40 for the place. Morton’s Fork is an impressive three-year-old which hasn’t finished worse than second in six career starts. The John O’Shea-trained colt has won back-to-back races and it looked well above average last start. It opened at $3.40 and has drifted out slightly to $3.50, but expect plenty of support on race day. Acatour couldn’t have been more impressive in winning at Rosehill last start and it’s on track for bigger targets. The Snowden-trained colt scored by three lengths over a midweek field, but it did it easily and suggested that the staying distances would be the way forward. It drops back to 1400m for this, but it still looks tough to beat at $2.35. Inside Agent looked promising when winning the Poseidon Stakes at Flemington last start and it’s at a good each way quote for this. The Nigel Blackiston-trained colt gets the inside draw which always helps around Caulfield and jockey Michael Walker will likely settle it in a forward position. Not the worst at $11. Flippant is fresh up here after two trials for one placing. The Snowden-trained mare has won twice fresh up and there has been plenty of support in the betting to suggest a big effort is expected. It opened at $5.50 and has since dropped to $5, so consider for win options. Super Cash was an impressive winner on this track last start when beating Mossin’ Around by a length. The Andrew Noblet-trained mare scored the easy win and showed that it’s capable of winning in these grades. It won the Moomba Plate when beating Sooboog in March and it looks a good bet at $4.60. Vezalay has been disappointing since winning this race last year, but it runs best at Caulfield and is a three-time winner over this distance. The Corstens-trained mare wasn’t too far behind Precious Gem in the Sangster Stakes last start, but it will be needing to produce its best to figure in the finish here. Don’t discount at odds of $7.50. Sebring Dream opened as the $3.20 favourite, but has since drifted out to $3.50. The Hayes/Dabernig-trained filly finished sixth behind Global Glamour in the Thousand Guineas and the step up to 2000m should suit perfectly. It hasn’t won since May this year, but if it gets luck from the wide draw it should figure in the finish. Moqueen finally broke through for the win last start and it was impressive in doing so. The Anthony Cummings-trained filly flashed home to win the Dulcify Stakes at Randwick and although this is another rise in class, it looks capable of holding its form. $5.50 with bookmakers. Eleonora was unlucky in the Edward Manifold last start when it was shut out at the 300m. The Murray Baker-trained filly had impressive form prior which included an easy win at Geelong and Baker knows how to win the big races in Australia. Oliver rides and it has been nicely supported at $5. Good Standing endured a tough three-wide run in the Caulfield Guineas, but battled on well for seventh. The James Cummings-trained colt had form in behind Impending and Astern prior which should hold up well for this. It needs to start winning more often for punters to gain confidence, but consider at $3.80. Highlad was unbeaten in two starts in New Zealand before running third behind Wine Bush in the UCI Stakes at Flemington. That form isn’t spectacular, but it didn’t have all favours during the run and it’s a colt with a fair amount of ability. Bred for the staying distances so include in options at $7. Seaburge is the form runner in the field following its second placing behind Divine Prophet in the Caulfield Guineas. The Hayes/Dabernig-trained colt has always had plenty of ability at the highest level and it looks ready to make its mark on the spring carnival. The inside draw isn’t fantastic, but it is the one to beat at $3.30. Tom Melbourne hasn’t had a spring to remember so far, but that could change here. The Freedman-trained gelding is coming off two average runs and it also missed the Cranbourne Cup last Sunday after the meeting was called off. This is the next best option for the six-year-old trying to force its way into the Melbourne Cup and punters are getting a good price for the win. It’s currently at $7.50 which is the best price offered for Tom Melbourne in some time. It’s Somewhat couldn’t have been more impressive winning the Craven Plate by 4.8 lengths and although the field was very average, it should go close to winning this. The John O’Shea-trained gelding has form behind Hauraki, Our Ivanhowe and Winx so the $3.10 looks a great price here and we’re expecting that to drop. Vanbrugh is a stayer which was running on late in the Group 1 Epsom Handicap and that form should stack up well for this. Trained by Chris Waller, the four-year-old hasn’t won for awhile and it hasn’t placed in three starts this campaign, but it has won at this distance which will help. $7 available with bookmakers. First Seal is having its first start in Melbourne and the change of scenery might do it some good. The John Thompson-trained mare wasn’t fit enough last start in the Golden Pendant, but it has good form second up and winning in this class has never been an issue. It is the class act in the race and the $6 is a good each way price. Tycoon Tara returns to Melbourne having run very well in Sydney. Now with Peter and Paul Snowden, the six-year-old has won three of its last four which included the Golden Pendant by two lengths. It has won twice on this track and it deserves to be the favourite at $3.20. Danish Twist produced a huge run for third in the Premiere Stakes last start and it should build nicely off that. The Kris Lees-trained mare is a four-time winner at this distance and despite drawing wide in barrier 13, it should go close. Chance at $4.60 after opening at $4.40. Sir John Hawkwood is a value runner at $15 following its win in the Group 1 Metropolitan Handicap. The John Thompson-trained gelding might be an eight-year-old, but it’s in career-best form and carrying a weight of only 53.5kg will be a big bonus. $15 is way over the odds for a horse proven at this distance. Real Love has been well backed into $7 after opening at $8.50. The Darren Weir-trained runner looked impressive winning last start and it won’t know what carrying a light weight feels like. The six-year-old is dropping down from 58kg to 52.5kg for this which will make it very tough to beat. Articus is an imported runner which has been well supported since markets opened. Trained by Melbourne Cup-winning trainer Andreas Wohler, the five-year-old is a winner of four from nine starts and punters are respecting the German form after Protectionist won the 2014 Melbourne Cup. Keep safe at $9. Our Boy Malachi did everything but win the Premiere Stakes last start and it’s a runner that thrives on confidence. The Hawkes-trained gelding is a four-time winner second up and despite being an eight-year-old, it looks to have plenty more wins in store. Tricky draw so it will need some luck, but punters are confident at $5.50. Hellbent is a classy four-year-old which produced a big finish to beat subsequent winner Sheidel by 2.25 lengths last start. Since arriving in Darren Weir’s stable it has produced some great runs and it looks well placed again to win this. Dangerous down in the weights at 53kg and it has been heavily backed into $2.05. Wild Rain is a capable sprinter which won back-to-back races before running third in the Moir Stakes behind Extreme Choice. That form should sit nicely in this and it’s a six-time winner at the 1000m. Drops in weight and looks a threat at $5.50. Takedown has shown its class by winning its last two races in Sydney. The Gary Moore-trained gelding won The Shorts before backing up with a win in the Premiere Stakes and it has shown a reluctance to give in. The four-year-old is a professional and we expect punters to take the $3.80 available. Voodoo Lad has been impressive this season and it lost no admirers when finishing second behind Bon Aurum in the Group 1 Sir Rupert Clarke. The Darren Weir-trained gelding rises in weight from that run which is a concern, but it has been running beautifully and it will likely launch over the top of them late. Current $3.60 favourite. Good Project was unlucky in the Premiere Stakes last start and it could give each way punters a good sight in this. The Waller-trained horse is capable of winning at this level and it has placed in seven from eight attempts at this distance. Chance in place markets at $3.80.